MINFO propagandist Sharon Smith Johns has tried to say FTUC didn't have a permit to meet in Nadi yesterday and should've known better than to gather under the PER. Smith Johns (left) insists the Congress never had permission in the first place to meet at Hexagon Hotel but the letter sent to Coupfourpointfive and other media outlets clearly says the permit was 'revoked,' which means one had to have been granted. FTUC confirms Nadi Police gave it verbal approval for the meeting but were not willing to give anything in writing until the day of the meeting when they turned up and issued a letter revoking the permit. We say this is another example of the incompetence (why doesn't Smith Johns or the hierarchy know what is happening on the ground?) and the misinformation of the unelected bandits running Fiji. It seems the union fightback has the regime on the backfoot. We've been told police were at a loss over what to charge FTUC president Daniel Urai when he was apprehended almost two weeks ago. Word is Nadi police had to make a number of calls to Suva before the edict came to go after Urai with the same charge prosecutors tried to unsuccessfully pin on Ro Teimumu Kepa - incitement and unlawful assembly. Sources say Urai (right) was at an island resort meeting with a worker who was fighting dismissal when police tried to say he was 'meeting' without permission and therefore breaching the PER. Police checks at the resort confirmed Urai was telling the truth but officers were told to charge him anyway. This is a clear case of the misappropriation of justice, where targeted individuals are clearly being harassed for simply going about their work. The military dictatorship will no doubt try to put another spin on things as it continues to try to justify its illegal reign. Sharon should tell the public first . why she was not re hired by connect. she put connect in 5 million dollar loss. this what kind of misinformation we get from the idiot con-lady. urai/union keep the good work up bro. OILEI!! !NUFF OF THIS NEWS THINGI. CAN ANYONE KIDNAP THESE TWO MADA. BY THE WAY...INTEL!! !GIVE THOSE FLYERS TO THE STUDENTS AT USP AND FNU AND OTHER SCHOOLS...THEY MAY ACT. OUR ELDERS WOULD RATHER SEE US DIE THAN STANDING UP FOR OUR FREEDOM. i bloody agree with the above! why is it so bloody hard to get rid of baini and khaiyuM...the thousands against two rotten apples...????????????????????? REVOLUTION....FIJI IS BECOMING A JOKE, WHEN THESE TWO CLOWNS ARE RUNNING THE COUNTRY AND NOT A SINGLE PERSON OR GROUPS ARE EVEN TRYING TO TOPPLE THEM....?????????????????? FIJI CITIZENS RISE UP ...NA GAUNA NI VEISAU QO...SA TOSO TIKO NA GAUNA..ME TOSO TALE TIKOGA NA NODA KILA KA...SA RUI LEVU NA VEI VAKALOLOMA TAKI ..O IRA NA VEILIUTAKI TIKO...SA KUA NA GALU KEI NA RERE! !MO NI VUKU TIKO...KUA TIKO NA TABETABE KEI NA VEIROKOROKOVI! O NI NA VAKALOLOMA TU GA...SEGA NA VEISAU....! O IRA NA VUTUNI YAU, SARA NA QAI KOCOKOCO..O IRA NA DRAVUDRAVUA SARA NA QAI VAKALOLOMA GA......!!!! !NI VOSA YANI....NI VINAKATA TU ME VEILIUTAKI TU VEI KEMUNI NA KAIDIA (MUSLIM , KHAIYUM. i cant believe that the people of Fiji seem to just carry on wth their daily lives,AND NOT care...REVOLUTION IS NEEDED NOW! RISE UP AND GAIN FREEDOM AND DEMOCRACY FOR FIJI. GOD BLESS YOU ALL..!! Sharon just needs a duna ni wadranu...for her lies just like the slippry eels. too many lamu sona's here in Fiji. can we get some real Fiji men SAS with real balls to shoot these thugs. Sharon is just another typical Kaivulagi 'do-gooder' who thinks that she knows whats going on and is doing what she can to help poor Fiji through its 'growing pains'. I feel sorry for her but I feel more sorry for Fiji that it lets people have the impression that they even need to feel that way. Take responsibility for yourself Fiji or stop complaining and let the do-gooders do good for you. I really like the positive attitude but the people are disorganised in their organised institutions because the current leaders are not doing their jobs; to lead...Look at the Methodist Church for example...during the good days their leaders had always wanted to be involved in politics; Tomasi Kanailagi becoming a Senator; talking politics and trying to influence the decisions of Government through their connections in the PM and senior Government officials. RIGHT WHERE ARE THEY NOW? CAN THEY STILL CONTINUE TO SHOW THAT KIND OF LEADERSHIP TO TAKE US OUT OF THIS MESS...ALL OF A SUDEN, NOBODY IS TALKING BUT ALL RIDING THE BASI NI TAVEUNI. Need to start against the thugs. As much as I support the Union leaders in their current quest for justice for their workers, I am dumbfounded as to why they would even had contemplated in the 1st. instance, supporting Frank and his Regime. All this suffering could have been avoided had they been wise from the beginning. The constitution of the Methodist Church is quite clear that the Church, through the Dept of Social Services and Christian Citizenship of which Rev Lasaro is Secretary, is duty bound to make a public stand on social, economic and political issues where biblical principles and God's justice are being compromised. So it goes against the legal and moral duties of the Church to say that it cannot discuss political issues which affect our God-given rights and human dignity"
thumbs up to the Unions. please can anyone here tell me how the media (Fiji TV ) does its work when it comes to reporting ?? it seems like they have no clue on what is happening ...!! unions must hold carry out the workers of fiji revolution with methodist church 1000 members. citizen arrest of the junta and put them to stand trial. united we stand and divided we fall. This is a pathetic attempt by Sharon Smith-Johns to explain away the busting of the FTUC meeting in Nadi on Saturday by Police. The incident was a clear demonstration of the deceit the despicable Bainibanana regime employs to lie to the people of Fiji. Smith Johns, and other scum that have betrayed Fiji to fill their pockets like Gates and the girly Pryde must not be allowed to escape when this human rights abusing junta is brought to its knees. These dogs must be dragged out on the street for all Fijians to see. Justice and the wrath of the people awaits them. Sharon, do you not have any conscience, do you not have any morals, do you not have any principles???? I guess the compulsive lying of both the PIGS have also rubbed off on you you VUAKA!!!! @ Anonymous or should I say Adi Ateca, thanks for your very articulate comments, I have been called worse than a pig. Sharon, it is NOT Adi Ateca!!! It is one hunk of a male. You available? Not to worry Sharon. To call you a pig would do injustice the poor animal. You are the SCUM of this earth!!!! i love the comments on this blog...well done people!!!!! sharon are you free for dinner tonight? Sharon seems to think that her sh.. and u...e does not smell the poor girl!!! Court jester in Aiyaz's treasonous court...Intelligentsiya! Here's a now dated piece from Graham " I-am-not-a-coup-supporter" Davis from last year where he tries to paint his fellow court jester's of Aiyaz's (it's not Frank's any more) court with clean and pure brush-strokes specifically aimed at appeasing their fellow Australian kin. Unfortunately for all of them, once stories like this bounce back into this neck of the woods, it paints them all as the opportunistic, self-serving, arrogant, colonial redneck bastards that they really are. FRANK Bainimarama is bewildered and seething with rage and frustration. The military man in him knows he's suffered a humiliating tactical defeat. And worse, he didn't see it coming. He's been rolled by someone he thought he could depend on most, the outgoing chairman of the Melanesian Spearhead Group, who has pulled the plug on a summit meeting in Fiji barely a week out and with no warning. 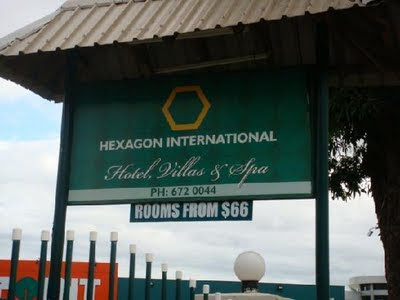 Expensive suites are booked, the pigs, kava and dancers all primed and waiting. It was meant to be Fiji's hour of triumph, chairman Frank briefly wearing the country's former mantle as Pacific leader. Instead, with his back turned at an International Monetary Fund meeting in South Korea, Australia has mounted a diplomatic counter-offensive, using a $66 million aid package to Vanuatu to strong-arm Prime Minister Edward Natapei into calling the meeting off. Natapei didn't even call Bainimarama to give him the news. So much for Melanesian solidarity. Now back in Suva, the dictator rails against the perfidious Aussies and their Kiwi cousins and the man he accuses of stabbing him in the back. Yet the military training kicks in, orders are barked, the telecommunications counter-offensive spreads out across the region. Within days, the MSG Plus summit may be off but the Engaging with Fiji summit is on, attracting a host of Pacific countries, including two crucial face-savers, the leaders of Papua New Guinea and Solomon Islands. It's been a roller-coaster ride of a week at the office, as Bainimarama's chief censor and media strategist Sharon Smith-Johns cheerfully concedes. "The mood was one of shock, anger and disappointment. Natapei didn't call. He just put out a press release dated Friday that I didn't get until Monday. Suddenly, bang! What do we do? "Obviously, we hit the phones but there were a few prayers too." With her flame-red hair and assertive persona, Smith-Johns would be a striking presence anywhere. Yet it's still startling to find this former Fairfax marketing executive among the coffee-coloured faces moving quietly in and out of Bainimarama's office, where he sits under a portrait of the Queen deposed by Fiji's first coup maker, Sitiveni Rabuka, 23 years ago. "I don't think I'm being disloyal to Australia. I feel disappointed with Australia that they can't see what I can see over here, a lot of positive changes. [Foreign Minister] Stephen Smith can take a swipe at us, I can take a swipe at him but my role is giving people a better understanding of what's happening in this country. I don't feel like a traitor, not at all." Multiple time zones away, by the East River in New York, another Australian citizen, Peter Thomson, is preparing for a diplomatic day of battle for Bainimarama as his permanent representative at the UN. Six months ago, his excellency the ambassador was a Sydney author and magazine writer, a face in the alfresco coffee crowd at trendy Coluzzi in Darlinghurst. Now, he's busy signing diplomatic relations for Fiji with a slew of countries it had never bothered to engage before as part of a strategy to broaden its global ties and escape the Australian yoke. "I've just come back from Cuba," Thomson tells me. "We're examining areas of co-operation in the medical field, in which Cuba is a world leader for developing countries. "We've got 160 medical students from the Pacific on medical scholarships in Cuba." 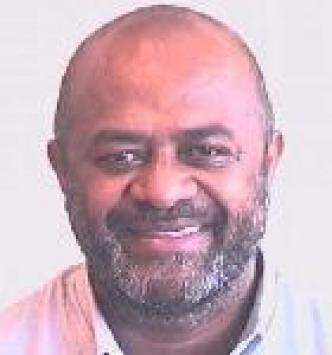 Unlike Smith-Johns, Thomson is Fiji-born and his connection to the country stretches back five generations on his mother's side. His father was a British colonial servant and Thomson himself ploughed through the ranks of Fiji's civil service in the stable immediate post-independence years, at one time consul-general in Sydney. But then came Rabuka's 1987 coup, when Thomson found himself a target as the high-profile white permanent secretary to Fiji's governor-general, embroiled in a constitutional crisis and with indigenous supremacists demanding his head. Three days in an excreta-smeared cell at Rabuka's pleasure convinced Thomson of the need to put down other roots, first in New Zealand, then Australia. More than most, he has cause to have deep personal feelings about the rise of Fijian nationalism and the steady marginalisation, before 2006, of the 40 per cent of non-indigenous citizens. "I'm a passionate advocate of a multi-racial, multicultural Fiji so I fully support Prime Minister Bainimarama's program," Thomson says. "Race-based constitutions and political parties have been very divisive for the nation. We're now working towards a future in which citizens will vote without regard for race for the first time." Fiji's UN ambassador is unusual in having triple citizenship: Australia, NZ and now Fiji, his passport restored when the regime ended a 40-year ban on dual citizenship last year. "To any notion of disloyalty or treachery to Australia, I'd say nonsense," he says. "I'm working to restore good relations in our region, not destroy them." Unlike Thomson's deep roots in Fiji, Smith-Johns first visited in 1994, then again in 1997 when cupid's arrow sliced through her holiday. "I fell in love with my diving instructor, the classic holiday romance," she laughs. "Then I moved here in 2000 right in the middle of George Speight's coup. Everyone thought I was mad." Marrying her diving instructor, Smith-Johns became chief executive of internet service provider Connect Fiji and met Bainimarama informally at a business forum. She wears her devotion on her sleeve. "I've become good friends with both him and his wife, Mary, who's a wonderful woman and a very close friend of mine," she says. "But he's my boss first and foremost and I have had occasions when he's bawled me out. But although he's tough, he's very fair." 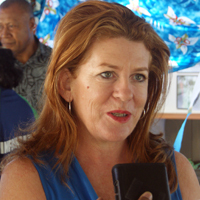 For all her NSW country girl charm, Smith-Johns is now widely detested in Suva as the official who presides over the government's media censorship, the final arbiter of what Fijians see and hear. She insists that 90 per cent of stories now get past the military censors but that's a figure hotly disputed by her newsroom critics, who also point to her role in what increasingly appears to be the imminent closure of the country's oldest newspaper, The Fiji Times (owned by News Limited, publisher of The Australian). Most damaging is the allegation that when Smith-Johns was head of Connect Fiji, she allowed the regime to tap into the emails of her customers, including journalists and human rights activists. "Absolute rubbish," she insists. "I take great exception to that. As a CEO, I could not and would not do that. We were never approached by anyone in government to tap emails. Never, ever." Smith-Johns concedes she was once asked to explore the possibility of blocking websites opposed to the regime. "It was pretty hard-core, nasty stuff but I still said no. I didn't think it was the right thing to do but in any event, it's a losing battle. Block off one website and another will pop up," she says. Twelve thousand kilometres away from the political blast furnace of Suva, Thomson finds many more friendly faces of all hues as he strides the corridors of the UN. "While Australia and NZ have obviously caused a lot of damage to Fiji's interests, the vast majority of diplomats I meet are very understanding of our efforts to carry out our reforms and bring long-term stability to the country," he says. Thomson is spearheading vital elements of Fiji's Look North policy, pursuing closer ties with China, India and the Arab world -- among others -- as a means of breaking free of its dependence on Australia and NZ. "We've applied for membership of the Non-Aligned Movement to forge a truly independent foreign policy, something we should have done a long time ago," he says. "Over the last five months, I've officiated at ceremonies formalising diplomatic relations with 17 countries, and there'll be many more before the year is out." Thomson and his wife Marijcke, a Sydney magazine publisher, were on holiday in NZ in January when the phone rang with Bainimarama's office on the line. "When your homeland has most need for your services, that is the most important time to serve and I had no doubt that I was equipped to do the job," he says. Thomson had been on Bainimarama's radar for 50 years, since his own father had served as a prison warden to Thomson's father in British colonial times. But it was Thomson's strong advocacy of Fiji's position in the past couple of years that persuaded the dictator to entice him back into Fiji government service. "I gave speeches in Australia to the Lowy Institute and the Centre for Independent Studies, as well as speeches in New Zealand, highly critical of their policy towards Fiji. It was pretty strong stuff about punishing Fiji without achieving anything and destabilising the whole region," he says. Thomson's views were shared by a number of Australian, NZ and Fiji business figures, who secretly commissioned him last year to launch what they called the Fiji Dialogue Project in an attempt to heal the breach. Thomson is speaking about the initiative for the first time. "These were prominent people with long records of service in the three countries, no personal agendas and a shared commitment to the wellbeing of the South Pacific region. They were as distressed as I was about the breakdown of the relationship," he says. And so Thomson embarked on a mission of personal diplomacy involving talks in Suva with Bainimarama and his foreign minister and subsequent trips to PNG and NZ. "I went under the radar to Port Moresby to meet Prime Minister Michael Somare and get his support for our efforts. Good progress was being made when the welcome news came that the foreign ministers of Australia, NZ and Fiji had agreed to a tripartite meeting. We thought, prematurely as it turns out, that our work was done," Thomson says. There was also a meeting in Tony Abbott's electoral office in Sydney before he became Opposition leader. Thomson says he got a polite hearing but no commitments when he told Abbott the other side to the Fiji story wasn't getting through. Through these efforts, Bainimarama and Thomson developed their high mutual personal regard. "The PM comes from a background of public service, as did his father before him. Remember, this is a man who only just survived an assassination attempt after he suppressed the ethno-nationalist forces trying to overrun Fiji. "This is the man who defused the time bomb of the 2000 coup, when George Speight's gunmen held the government hostage for 56 days. That was Fiji's greatest trauma and the country never wants to see it happen again," Thomson says. Thomson and Smith-Johns say Bainimarama's promise to hold elections in 2014 are central to their support for him and they believe he'll keep his word. "There will be an election in 2014," says Smith Johns. "No doubt about it." To " revoke" means in simple English, that one 'withdraws' what one had agreed to earlier. To not "APPROVE" is something else. Get it white woman? No wonder you married a diver!! Shows your mentality does it not? When you open your mouth you face the risk of showing your weakness!! @annon 10.29am....you say `he defused the yr2000 ethno ...whatever..time bomb!!! !what a load of garbage. He was there from day one ..who do you think authorised the release of weapons from the armory to be taken to Nukulau on day of civilian takeover at Parliment? I would strongly advice you leave the events of 2000 be.....it`s been paid in full by GEORGE`s life.Want to know the truth?..ask the AG for a truth and reconcliation forum. It could well be the solution to the clean-up campaign plan.